You could say Gregory Faupel spent some time being lost. He learned of his HIV status in April of 2012 and as he says, "The diagnosis was both mentally and physically shocking. My viral load was 350,000 and my CD4 count was 192. I also had bilateral palsy. “That's a paralysis to both sides of your face. I couldn't talk, I couldn't eat, I had to tape my eye lids shut at night so I could sleep. Everything went down-hill. I was pretty much into any drug as well but I was an IV drug user." In 2014 he was living in Columbia, Missouri and as he puts it was "At the bottom of the barrel." He had just gotten out of rehab for the second time, was living at a half-way house and was working fast food. He got to the point where he was missing his family and their support and moved back to the St. Louis area. Things started to turn around for Gregory when he started to take charge of his future. He said, "While I was in rehab, a counselor suggested Vocational Rehab. If you have a disability, your tuition can be partially or fully paid. I was originally a music and theater major, Id been in over 200 plays and shows and really saw how that correlates to social work because you have to put yourself in others shoes." In 2015, Gregory was accepted into the University of Missouri St. Louis Social Work Program. He also started out as a volunteer with the St. Louis Effort For AIDS. He said, "I had been working the front desk for awhile and we had 2-walk-in testing days. Testing went from 9:30-to-11 then from 1-to-4. There were so many people that would come in and only one tester so they were turning away 11-to-12 people every testing day. At the time, I was taking a grant writing class and decided, with the help of a few classmates, to apply for a grant to further fund the testing program." He continued, "The grant was approved by the Episcopal Presbyterian Health Trust and that allowed for a second tester. So with the second tester, they work through lunch and go to 7pm. There was a 150-percent increase in productivity from before." Gregory was approached by management to be the Prevention Outreach Volunteer Coordinator because of his obvious dedication to his job and the cause. It also allowed him to use the job for his internship requirement for his degree. Gregory says, "People ask 'why do you do what you do?' I tell them it's because of what I've been through. I stay with people after their diagnosis to make sure they know the resources that are available to them. If I speak to a group, I find that there's usually three people in the room that ask to speak with me later. "I like to let people know the way it is now. It's not the 80's anymore. Many people haven't been informed about the advances and PrEP. I also tell people to get tested every three months - It's free! Why not? When it comes down to it, It's education that protects you. If you're a human being, you can get HIV." Today, Gregory works at EFA as a Prevention Specialist. He is the Prevention Outreach Volunteer Coordinator and leads a group of eight volunteers to provide free HIV/STI testing weekly at several events around the St. Louis area. These include late night testing at local bars and Club Saint Louis' Club Outreach and Resource and Education Center (CORE). Gregory actively participates in development at EFA with Dining Out for Life, Art of PAWS, and Thirst for Life. He is currently working on ways to improve the outreach department with providing STI treatment. 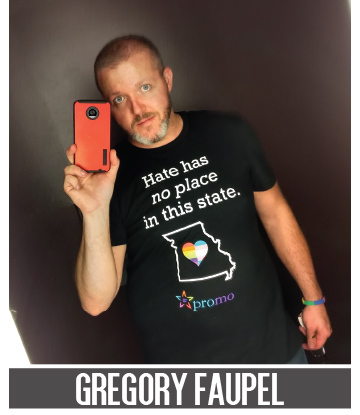 Gregory also works at PROMO, Missouri’s statewide organization advocating for lesbian, gay, bisexual, and transgender equality through legislative action, electoral politics, grassroots organizing, and community education. He is also the Graduate Assistant for UMSL's Gender Studies Program and plans to graduate in Spring of 2018 from the University of Missouri - Saint Louis School of Social Work Master's program. Gregory is also a member of the Show-Me Bears, a social and charitable fundraising organization whose aim is to promote interest in bears. Through a variety of annual and special events, they raise money for local and regional HIV/AIDS-related charities. He is the chairman of Show-Me Bear's HiBearNation in 2018 where all proceeds benefit local ASOs in the Saint Louis region and was voted Mr. Heartland Bear. Gregory is actively involved with Rudis: Men's Leather Society, Mobilize Missouri, Pride Saint Louis, and PROMO. He also volunteers for local fundraising and volunteer events at St. Louis Food Outreach. He just celebrated 4 years clean from intravenous drug use on November 11th. For more information on the Show-Me Bears please visit www.showmebears.org.